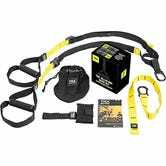 The TRX Suspension Trainer kit can give you a full body workout in your house without the space commitment of an actual home gym, and Amazon’s marked it down to an all-time low $100, today only. If you have any fitness-focused new year’s resolutions starting soon, this will give you a fighting chance to actually achieve them. Funny story: The last time it was this cheap? 12/21/16.